A Masonic hoodwink is a type of blindfold used in Masonic rituals of initiation. The image, above is of a man in a Masonic hoodwink which dates from the early 1800's to the early 1900s and were sold by DeMoulin, a Masonic lodge supplies manufacturer, as well as other purveyors (sellers) of lodge supplies. Freemasonry is not the originator of the hoodwink. Religious rites and initiations of civilizations and tribes dating back centuries before the believed or known origins of Freemasonry used blindfolds to represent going from darkness (ignorance) to light (knowledge). Hood: The word, “hood,” in old German and Anglo Saxon refers to a head covering, as in a hat, or helmet. A hood might also be of cloth. To "hood" is to cover. Hooded garments have been worn throughout history. Wink: The word, “wink,” in old German and Anglo Saxon refers to a closing of the eyes. The word, “wince,” , is similarly derived from the word "wink". The word "wink" pertains to the eye. Therefore, a hood (to cover) wink (eyes) was a head covering designed to cover the eyes. Misconception: While Freemasonry has many secrets, the term "hoodwink" is not one of them. The word is often misconstrued by non-Freemasons as having negative overtones due to our more modern-day definition of the word which defines it as meaning to be deceived or tricked rather than its actual meaning which is to cover the eyes. A Masonic hoodwink is not used as a method of deception. It is simply a symbolic and visual method of covering the eyes which is used in the initiation of the candidate into acquiring new knowledge, hence the term, "from darkness to light". The Masonic symbolism of the hoodwink is not about placing the candidate into the darkness, which is symbolic of ignorance, but about the removal of the darkness to let in the light, which is symbolic of knowledge. "A symbol of the secrecy, silence, and darkness in which the mysteries of our art should be preserved from the unhallowed gaze of the profane. It has been supposed to have a symbolic reference to the passage in Saint John's Gospel (I, 5), "And the light shineth in darkness; and the darkness comprehended it not." But it is more certain that there is in the hoodwink a representation of the mystical darkness which always preceded the rites of the ancient initiations." 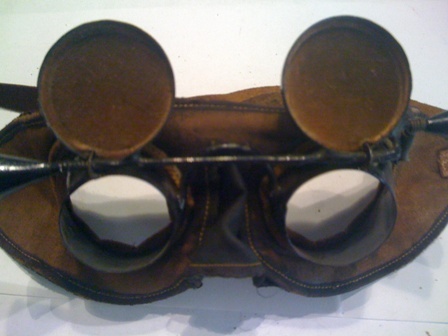 Somewhat resembling aviator goggles of this same era, this antique Masonic hoodwink is made of metal, leather, cloth and velvet. Size: 8-1/2 inches long, 3 inches wide and 2 inches in depth. Front: The front of this hoodwink is made of metal, painted black. The nose covering is made of fabric which has been hand-stitched into place. Eye "wink": The round metal circles which cover each eye are welded to a cross-piece rod with cones on each end. This entire unit is of one-piece construction. It is spring-loaded and can be raised or flipped upward toward the forehead by grasping either of the 2 decorative, cone-shaped metal pieces located on either side of the eyes. 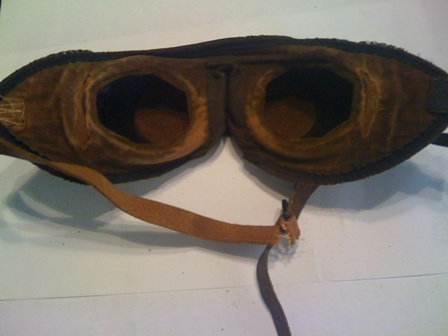 Back/Interior: The interior, which fits against the face, is made of velvet (original color, unknown), as are the insides of each round eye piece. 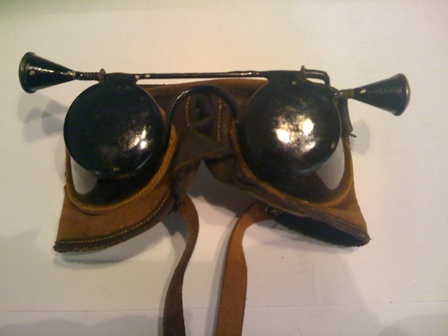 A leather strap fits around the back of the head. 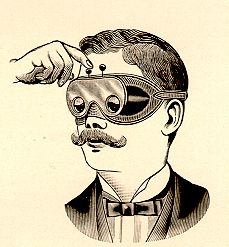 Like other fraternities, such as college fraternities, most Masonic lodges, today, simply use modern-day blindfolds. The antique Masonic hoodwink, above, would most likely be found in a Masonic museum or owned by a collector of Masonic memorabilia.